Sun Peaks Ski Bikes are a new and exciting addition to the long list of winter activities at Sun Peaks. They have been popular in Europe for years and are now quickly spreading to ski resorts throughout North America. Also known as Sun Peaks snow bikes or Sun Peaks ski bobs, these unique-looking ski bikes combine the thrill & skill of alpine skiing with the movement of mountain biking. They provide a cool way to enjoy the beauty of Sun Peaks and other ski resorts for those that can't ski, can no longer ski (the knees don't work like they used to!? ), or just don't want to ski and prefer to give their muscles a break while challenging themselves and enjoying another exciting Sun Peaks winter sport. The new owner of these ski bikes, "Babo" Stefano Babich, is super friendly, a great coach/instructor/ski bike guide, and wants to ensure all his guests have a fantastic time. 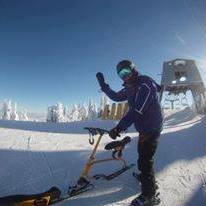 Ski or snow-biking is fun for skiers, boarders, non-skiers, individuals, families, or small groups, with 8 ski bikes currently available for rent at Sun Peaks. To ski-bike, you will need warm, winter clothes, a Sun Peaks lift pass, ski or snowboard boots (available for rent through Sun Peaks), and must be aprox. 12 or older due to the size of the bikes. We also strongly recommend using or renting a ski helmet for this and anytime you are on the hill. "So much fun!!! Takes very little skill to get going really quickly. Babo (Stefano Babich) was an awesome instructor and made it very easy to learn. Accessible for all abilities and all (adult) ages. Great way to mix up the downhill snow activities." 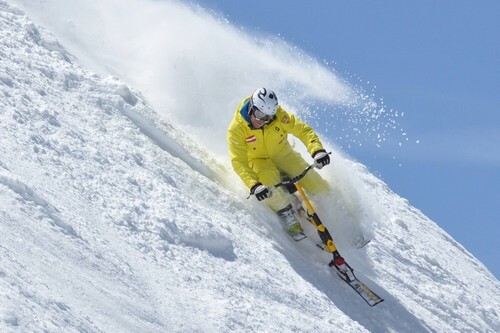 Your ski bike experience and tour begins by watching a brief instructional video and then a practice session before hopping onto a chairlift with your ski-bike and your guide. 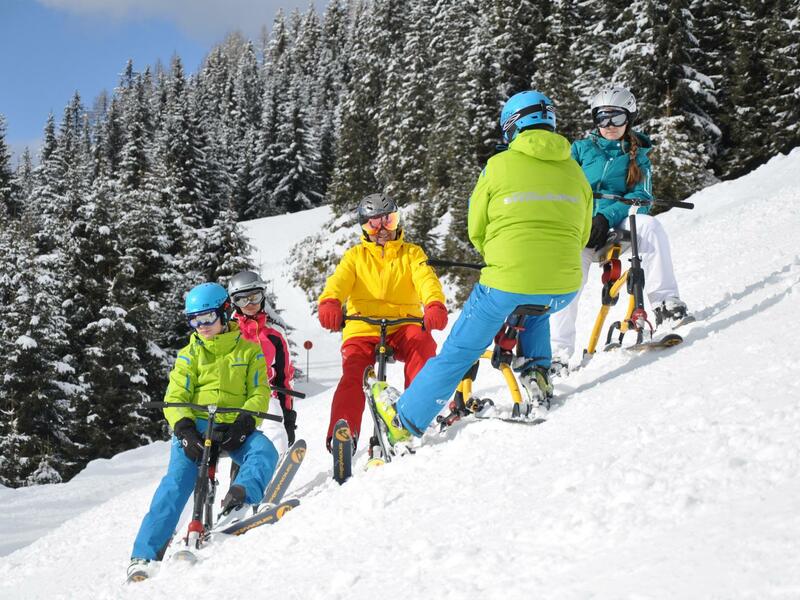 The whole session lasts around 2 hours, and once completed, you are able to rent the ski-bikes without a lesson or guide for future fun. And for those who are not able to ski bike but still wish to experience the thrill of skiing and explore the beautiful terrain and mountains, check out Sun Peaks Snow Limos where a trained guide will 'ski' you down the hill in style (non-skiers, individuals with physical disabilities, those that want to enjoy a Sun Peaks Evening Fondue & Descent but can't ski for whatever reason, etc.). For more information, or to make a reservation, visit the Sun Peaks Ski Bikes page, complete and submit the form below, or call 250-578-5399 ext 1, or 1-800-807-3257.